So darling, aren’t they? I just love fresh-cut flowers, and how they seem to enchant any room they inhabit. 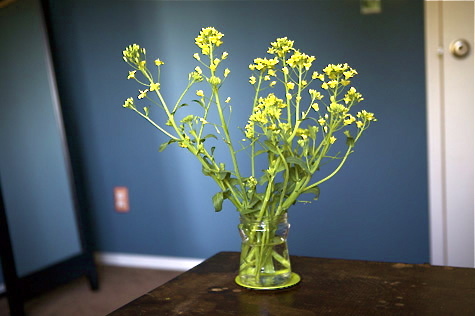 Even a few stems of a single style, in an old salsa jar, and it’s instant cheer. And the source shouldn’t matter, right? Even if it’s . . .
. . . my bok choi!?? Yup, those are some bok choi buds that are gracing my table. Well why not?! We’ve had some real heat in the past few days, and my confused cool-weather babies just bolted. They panicked, and the poor little guys shot flowers out over night! But I don’t mind. Now I get to gobble down greens as fast as I can (oh darn! 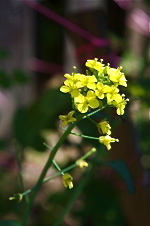 ), and I’ve got lovely little buttercup-colored flowers to fill the house, and I’ll have some precious real estate opening up in the garden. With all my seedlings in full spring swing, a little more space is just what I need. But don’t tell my house guests they’re staring at salad flowers! Hahahaha this is great! You’re such an inspiration! LMAO! 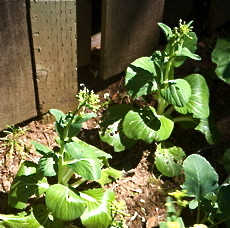 That’s so funny – we noticed our bok choy flowering a few weeks ago, but at first we thought the broccoli had mysteriously moved :-o but then I took a look at the leaves and cleared up the confusion lol.